There are few things dog owners can appreciate more than a multifaceted toy. The most popular of these toys usually offer some form of teeth cleaning. I was excited to review Bristly, which does just that. Is it a toothbrush? Is it a chew toy? Well, it’s a bit of both. Originally Bristly began on Kickstarter and managed to earn over $400,000 last year, going well and beyond their target goal. You can now visit them to order on their website here, which will then take you to the IndieGogo page to complete your purchase. Does Bristly work? Is it fun? My best buddy, Chance, gave it a try. Here’s what he thought. I must confess that when I first opened up the Bristly package for Chance, he was incredibly confused, albeit highly excited. Bristly is T shaped, ideally giving a dog footholds to grip the toy while they chew. Unfortunately, Chance, being the destructive animal that he is, wasn’t sure what part of the product to chew on. Naturally, when a dog is in doubt, they’ll chew everywhere until they find that ideal spot. This is more or less what Chance did until he finally figured out which side to chew on. Once that mystery was solved, he thoroughly enjoyed ravaging the Bristly brush for days on end. What fascinated me the most about Bristly is how simple it is in its structure. 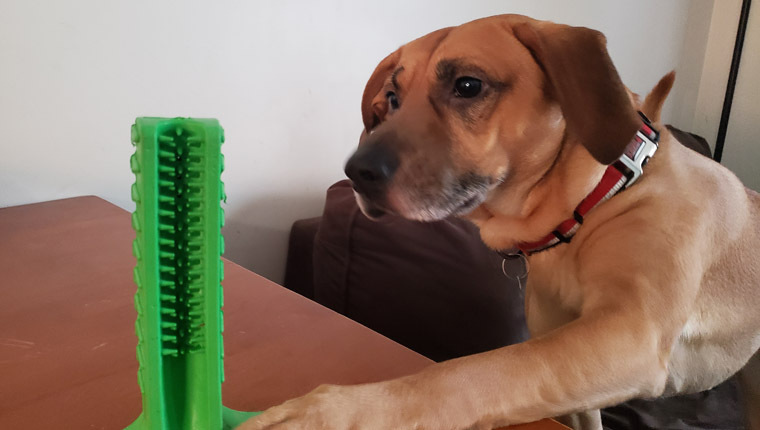 There are toothbrush-like bristles at the main stem of the toy, and these are what do the cleaning for your dog’s teeth. 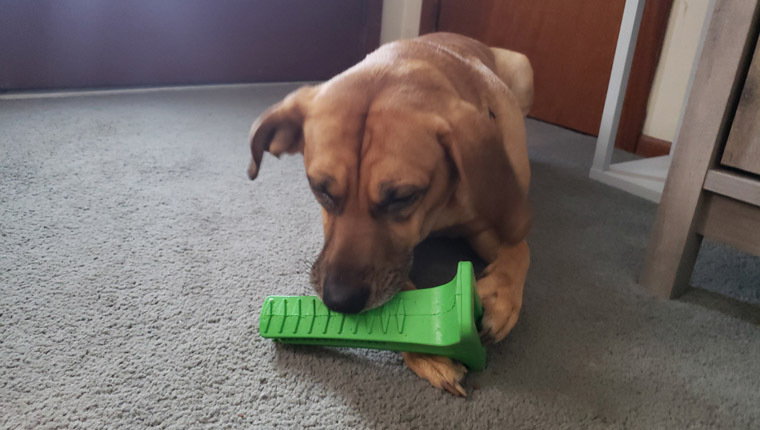 While I’m not sure how deep of a clean this will provide for a dog’s teeth–it doesn’t get all the way up to the gums in my dog’s case, so that may be worth noting–it would definitely be good at dislodging food from your dog’s teeth if this is a problem for them. Bristly’s material is also very durable. It stood up to Chance’s diamond-hard back teeth with little wear or tear to show for it, which is probably the most amazing aspect of this item for myself as a pet parent. While I may have referred to Bristly brush as a toy, it really isn’t intended to work as such. It is intended to be a one-time-a-day-use item. Applying a dog-safe toothpaste and giving Bristly to your pooch for up to ten minutes should suffice to help your dog clean their teeth. The ridges on each side act in a similar manner to the toothbrush you and I use daily. It scrubs at teeth to loosen plaque and prevent gum disease. 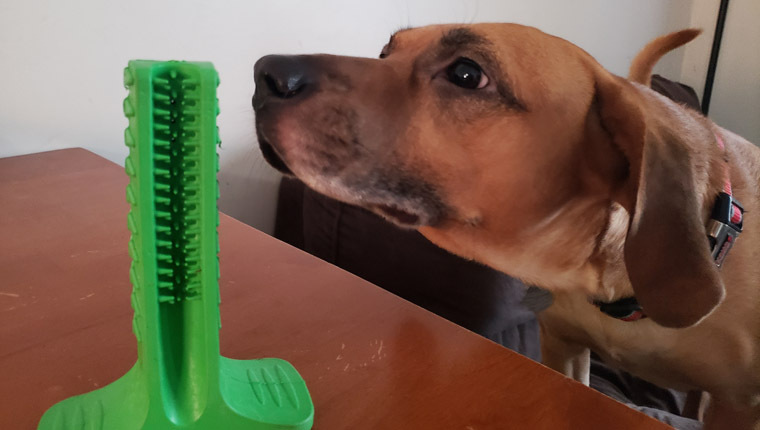 Overall, for the price that Bristly is going for and the amount of fun my dog had with it, I would definitely recommend it for anyone struggling to get their dogs teeth clean. The writer of this review received no financial compensation from the makers of Bristly for any opinions expressed in this article.